Given album art is an important part of the digital music experience, it's important to ensure album art is present and correct, regardless of whether we are using software or hardware based music players. This week we look at the Cambridge Audio 851N and CXN network players' album art requirements (spoiler: there aren't many!) and how to configure bliss to ensure those storage requirements are met. Cambridge Audio manufacture several different series of hi-fi products. In each series there are multiple products; amplifiers, CD players, DACs and more. As ever, it's the computer audio components we are interested in, specifically the Cambridge Audio network players. The network players currently sold in the Cambridge Audio hi-fi range are the 851N and the CXN. These devices offer the ability to display album art, both on the device itself and also via the app used to control the players. We all know by now that album art is essential to the digital music experience, so we want to make sure that the album art is displayed when we browse the music in our music library. When working with the Cambridge Audio network players, the important factor is the music source. Either the music is streamed from a separate UPnP server, or it is stored in some sort of portable storage and connected via USB to the network player. When playing from a UPnP source, the artwork must be embedded. When playing from a USB source, the artwork must be in a Folder.jpg file located in the same folder as the album music files. As these rules are not contradictory, that offers the possibility of applying both rules using bliss. In any case, I would recommend both embedding and saving a separate image file in the interests of general music library best practice and achieving compatibility with as much software and hardware as possible. Just a note before we go into the walkthrough. UPnP is a standard by which music (and other media) can be streamed to your 851N/CXN network player. There are numerous UPnP servers which comply with the standard, so you can connect your player to that server. However, that doesn't mean all UPnP servers work the same in areas not covered by the specification. For example, it's not unknown for some UPnP servers to shrink artwork before streaming it, regardless of the size of the embedded images. That can be a problem because the streamed image is not of a resolution to provide a satisfactory display in the Cambridge Audio app. We'll start assuming you have already downloaded and installed bliss. 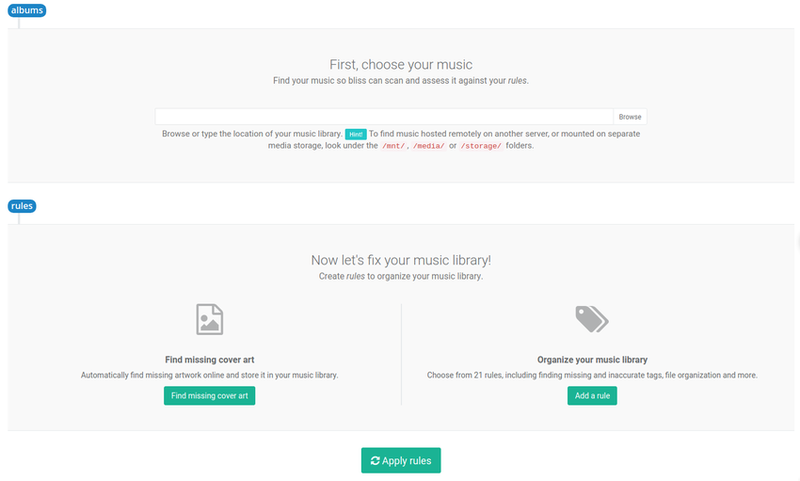 If you are using a UPnP server to stream the music to your network player, this will be the location of music from which the UPnP server streams. This may be on the same computer on which you run bliss, if the UPnP server is running on your computer. If your UPnP server is running on a NAS, you will need to mount the network drive. If you are using a removable USB drive then you should point bliss at the music folder within the drive. On Windows, this should show as a named drive, e.g. "Y:\". On OS X, the folder should appear under /Volumes. There are further options revealed by pressing more which allow control over artwork sizing. 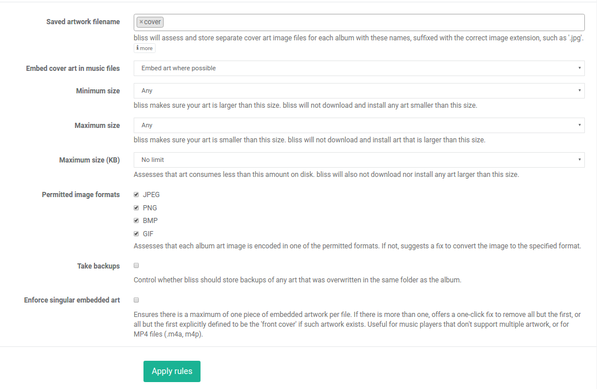 If bliss finds an album with embedded artwork, but without a Folder.jpg, it will save the embedded artwork to Folder.jpg. It will perform the same activity, vice versa, when the embedded artwork is missing but the file exists. If both items are present, bliss will not perform any work. I hope this helps complete your Cambridge Audio album art, and ensures it displays on the devices or in the app!